Avoid too many sweets this Halloween season by donating your extra Halloween candy to overseas veterans and troops. Learn more here. Are you sitting down? We’ve got a startling Halloween candy statistic for you. Did you know that each Halloween, the average child eats enough candy to translate to about 3 cups of sugar? That’s a huge amount of sugar, and there’s no question that it’s not good for your child’s teeth or health. So, what’s the answer? How do you make Halloween an enjoyable holiday without destroying your kid’s teeth, but still allowing them to have fun? There are many answers to this question: reduce sugar intake, swap out some of their candy for tooth-healthy alternatives, and, finally, take some of that candy and make it into a donation – namely for the troops! This October, we’re supporting a cause called “Treats for the Troops.” For the entire month, you can bring bags of Halloween candy to our office in Orange Beach and we will donate it to the USO Pensacola Chapter at the airport for traveling service members. People can bring treats during our normal business hours and we will be donating the candy after Halloween. This is a great way to provide a sense of home for troops and their families who are serving overseas, protecting our safety and liberty. Because there’s not much trick-or- treating on military bases, this is one of the best ways to ensure these hard-working men and women can enjoy the fun (and delicious treats) associated with Halloween. 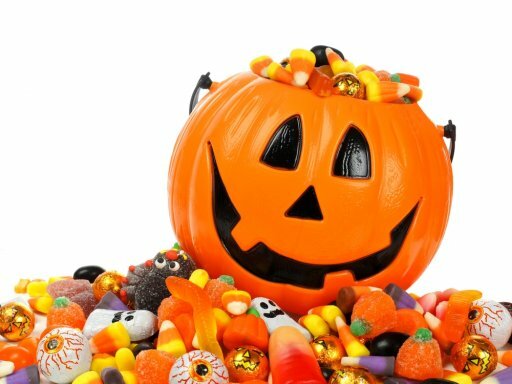 Aside from sending some of your candy along to the troops, how can you cut down on your risk of cavities, avoid too many sweets, and keep your teeth healthy during the Halloween holiday? Choose treats carefully. If you’re going to “treat” yourself (and, hey, you should!) pay some attention to what you’re eating and when. Sticky candies like caramels and taffy tend to attach to the teeth, creating cavities and dental decay. Likewise, hard candies stay in the mouth for a longer time, and coat the teeth with a layer of sugar that can lead to decay down the road. With this in mind, choose candies that you can eat quickly, and that won’t stick to your teeth. Brush your teeth immediately. Welcome to brushing tips 101! Once you’ve enjoyed your sweet treat, brush your teeth right away. This is the best preventative method to banish the layer of sugar that candy creates in your mouth, promotes clean teeth, and makes it harder for dental decay to begin. Look for sugar-free alternatives. Some of the tastiest treats are actually sugar-free. This year, don’t hem yourself in by insisting on full-sugar versions. Instead, check out sugar-free options that taste great but can save your teeth some decay. Happy Halloween, for the Troops and Your Teeth! This year, spread the Halloween joy by donating bags of candy to Treats for the Troops. While you’re at it, remember to keep your family’s teeth healthy with good dental hygiene and regular visits to our team. Contact us today if you need to set up an appointment or if you would like more information about donating candy!